The Orielles, Stealing Sheep, Tracyanne & Danny, Bis, Withered Hand, The Spook School, Big Joanie, Adult Mom and Peaness are among 45 artists confirmed today for this year’s Indietracks festival. They’re joined by Holy Now, Young Romance, Mammoth Penguins, Porridge Radio, Strawberry Generation, Randolph’s Leap, The Catenary Wires, Molar, Witching Waves, Thud, Seazoo and L I P S.
Plus, we also have Fresh, Jetstream Pony, Child’s Pose, The BV’s, Cheerbleederz, Kermes, Kagoule, Junk Whale, Athabaska, Songs For Walter, Current Affairs, Kidsmoke, Owls of Now, Foundlings, Solution Hours, Grawl!x, Squiggles, Common Or Garden, Nim Chimpsky, Jacqui and Geoff, JC Quick, Rosehip Teahouse and She’s Got Spies. It all takes place on the weekend of 26-28 July 2019 at our picturesque steam railway in Derbyshire. We’ve artists playing on four stages across the site, plus steam train rides, discos, art and craft workshops, children’s activities, museums, real ale and street foods. We’re very happy to announce that Martha, Desperate Journalist, Advance Base, Best Praxis, Lost Tapes, The Proctors, Surf Muscle and The Sunbathers are all joining the Indietracks 2019 line-up. Martha have just released an amazing new album, ‘Love Keeps Kicking’, and we can’t believe it’s already been four years since Desperate Journalist played their incredible show at Indietracks. We’re also delighted to welcome Advance Base – the electronic solo project of Chicago, IL singer/songwriter Owen Ashworth (formerly of Casiotone for the Painfully Alone). We’ve announced over 50 artists now, and there are biographies for everyone over on our website. After the bands, we’ll have discos with Fan Club, Paris Popfest, Grrls Like Us and Come Out 2Nite, as well as Bum Notes Karaoke with Ruby Waters. And we’ll have early evening children’s discos with How Does It Feel To Be Loved? and Some Like It Pop. We’re delighted to say that British Sea Power, Honeyblood, The Lovely Eggs, Dream Wife, Girl Ray and Sacred Paws are among 35 artists confirmed today for this year’s Indietracks festival. The above artists are joined by Darren Hayma (playing ‘Breaking God’s Heart’), Even As We Speak, Haiku Salut, Onsind, The Smittens, Anna Burch, Boyracer, Night Flowers and Eureka California. Plus, the following bands are also joining the bill today: Happy Accidents, Let’s Whisper, Wolf Girl, Just Blankets, Dream Nails, Mikey Collins, Sink Ya Teeth, Tugboat Captain, The Baby Seals, Life Model, Cat Apostrophe, Strange New Places, Melenas, Panic Pocket, French Boutik, Ghum, Rebecka Reinhard, Tekla, Whitelands and The Sunset Beach Hut. Blossoms have been announced as the final main stage headliner for Bearded Theory Festival. The band joins the line-up alongside previously announced headliners Robert Plant, Seaford Mods and Jimmy Cliff. The independent family friendly festival, taking place from Thursday 24th May to Sunday May 27th, combines a variety of diverse live acts from indie to punk with classic festival acts including The Coral and Fun Lovin Criminals. The festival will also provide a variety of non-musical entertainment over the weekend from tea tents to a comedy woodland. Taking place at Catton Hall in Derbyshire, Blossoms will headline the Pallet Stage at Bearded Theory on Friday 27th May. Also performing on the day will be bands including The Jesus & Mary Chain, The Coral and Milburn. With more than 80% of tickets for this years festival already sold, 2018 is looking set to be the festivals 9th straight sell-out year in a row!. Four-day tickets include camping and are priced at £115 for adults (16+), £55 for those aged 12-15 and £28 for 6-11 year olds. This is the official compilation of artists playing the Indietracks Festival in Derbyshire (UK) on 28th-30th July 2017. Indietracks is a celebration of independent, creative and DIY pop music. It takes place on a heritage steam railway site in the heart of the Derbyshire countryside on 28th-30th July 2017. Artists announced so far include The Wedding Present, Cate Le Bon, Martha, Joanna Gruesome, Frankie Cosmos, The Tuts, The Wave Pictures and Skinny Girl Diet. Huge thanks to all the artists who donated their songs. The copyright of these songs belongs to the individual artists and/or labels. Please see individual tracks for more information. Here’s a list of the artists playing at Indietracks in 2017, with biographies further down the page. The Wedding Present, Cate Le Bon, Martha, Joanna Gruesome, The Wave Pictures and The Tuts are among 38 artists to be confirmed today for this year’s Indietracks Festival. The above artists are joined by Shopping, Monkey Swallows The Universe, TeenCanteen, The Orchids, The Hearing, Peaness, Personal Best, The Hayman Kupa Band, Grace Petrie and Kid Canaveral. Plus, the following bands are also joining the bill: Charmpit, Chorusgirl, Cola Jet Set, Cowtown, Crumbs, Dan Webber, Daniel vs the World, David Leach, Evripidis and his Tragedies, Garden Centre, Lilith Ai, Maybe Don’t, Milky Wimpshake, MJ Hibbett and the Validators, Model Village, The Perfect English Weather, Pillow Queens, Rainbow Reservoir, Red Red Eyes, Schande, Suggested Friends, and th’sheridans. There’s biographies for all the bands over on our line up page. Last year marked the 10th anniversary of Indietracks festival. For a number of the team behind the nation’s premiere Indie-Pop festival in a train museum, it also marked the end of their involvement in Indietracks. After a number of years spent helping to organise the festival, Ian Cowen, Marianthi Makra and Alice Hubley all left the team. Rumours were circulating it might be the end of Indietracks all together, but after an outpouring of support, the remaining members of the team, Nat & Andy Hudson and Emma Cooper, decided the show must go on and set about recruiting new members to the Indietracks inner-sanctum. Enlisting the help of Cambridge Indie-Pop Alldayer organisers, Beck Conway and Emma Cooper (from Mammoth Penguins/Standard Fare and not the same person as the other Emma Cooper), as well as Indietracks regular Jasmine Allen, Team Indietracks re-emerged, and have put together one of their strongest line-ups to date. There’s surely a headliner for everyone’s taste; the return of the legendary The Wedding Present, the enigmatic and brilliant Cate Le Bon, and a first ever festival headlining slot for Durham’s DIY-upstarts, Martha. Elsewhere there’s the usual eclectic mix of acts; The Wave Pictures will bring their blend of English wit and American blues-rock, the reformed Monkey Swallows The Universe will showcase Nat Johnson’s inimitable songwriting talents, and glistening dream-pop quartet Chorusgirl will hopefully be showcasing new material from their upcoming second album. Seeing The Pooches name on the list for this year’s Indietracks was thrilling, not only because they’re quite brilliant but because I know they’re the perfect fit for the festival. Everyone will love them and they deserve a hell of a lot more love than they get. As ever there’s also plenty of smaller bands from the indie-pop and DIY-punk scenes; larger than life Anglo-American trio Charmpit will provide copious amounts of sass, Model Village will provide some much needed relaxation with their take on mellow sophisti-pop, and Peaness will set about justifying their seemingly unstoppable rise, with their perfect harmonies and tongue in cheek humour. Tickets are now available at an early bird discount price of £72 (weekend) and £39 (day), excluding booking fees. These cheaper prices are available until 9pm on Sunday 14th May. Headlining Saturday night we proudly present; STEREOPHONICS. 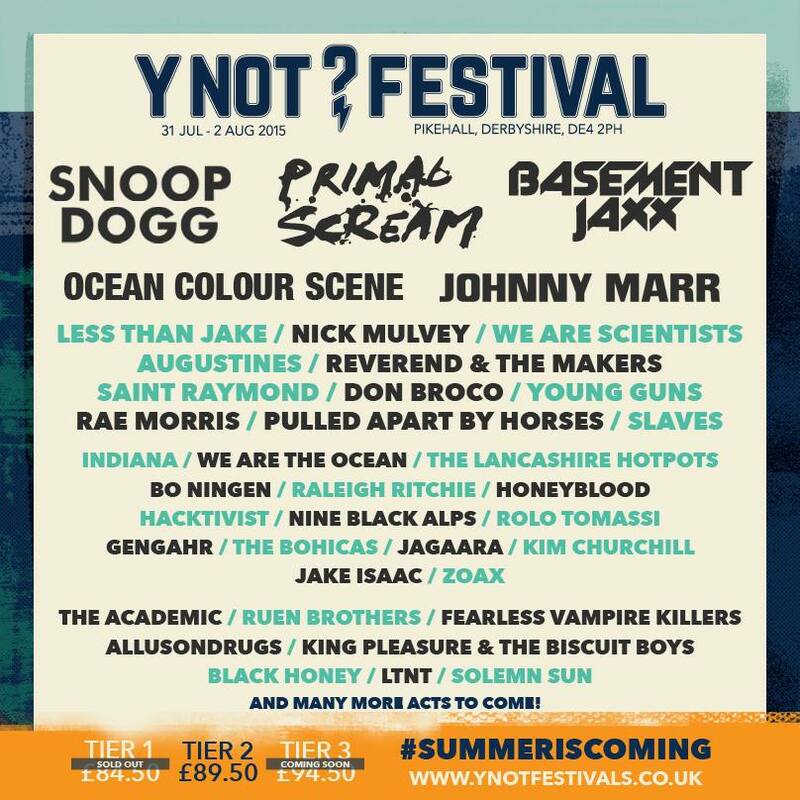 The legendary band are going to be bringing their giant back catalogue of hits to Y Not and we can’t breathe, we’re that excited. On Sunday night we’ll be busy trying to keep up with the lyrics to ‘Something Good Can Work’ with party starters; TWO DOOR CINEMA CLUB. Friday night will see THE VACCINES pay the peaks a visit, playing us loads of their platinum selling hits for a massive sing along. If that wasn’t juicy enough for you, CLEAN BANDIT, Notts original JAKE BUGG, SLAVES and MAXIMO PARK and FEEDER (Thurs headline) will also be joining us. 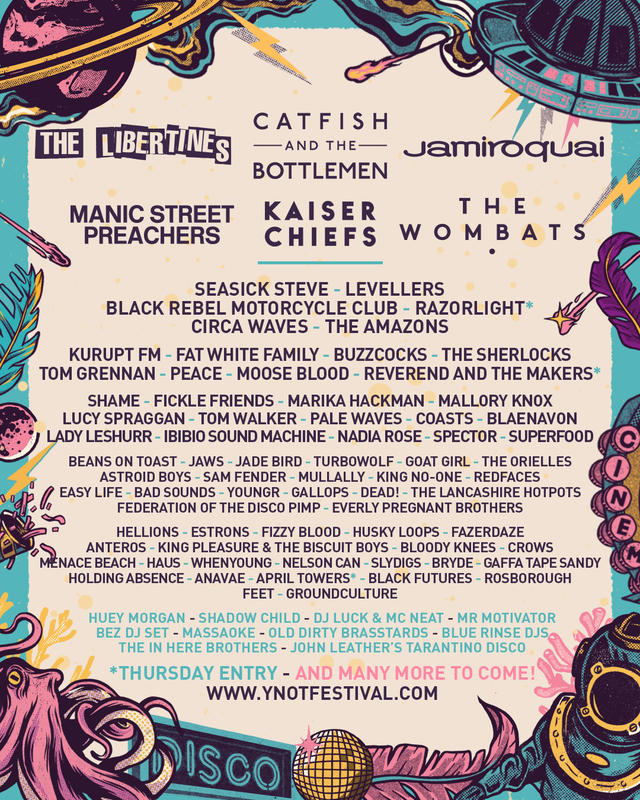 Nothing But Thieves, The Hunna, Cast, Sundara Karma, Kate Nash, Palace, Cabbage, Fickle Friends, Pulled Apart By Horses, Tom Grennan. Jaws, Beans on Toast, Roam, Heck, Tigercub, Muncie Girls, Shvpes, Grumble Bee, Bad Sign, Banfi, Crows, King Pleasure and the Biscuit Boys, The Everly Pregnant Brothers, Trash and Eyre Llew.